P&M Quality Construction is an approved, authorized Casablanca Fan Company installation and repair service. Our technicians have extensive experience in integrated controls and accessory installations. Slide, rotary or remote touch pad repair are within our expertise. Casablanca's superior workmanship and life span allow you to change your blade finish or lighting accent. P&M Quality Construction has the resources to find updated or your hard-to-find replacement blades, switches and globes. 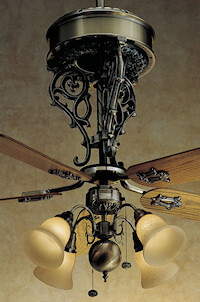 Casablanca fans are designed & assembled with high quality parts and engineered for superior energy efficiency. These classic fixtures are as efficient as ever and almost timeless. Casablanca fans have a legendary reputation for quality and reliability. From the furniture-grade wood veneer on the blades to the bearings in the motor, the exquisite craftsmanship of a Casablanca fan extends deep beneath its finish. Discerning consumers know that quality construction and meticulous attention to detail create a superior product, which ultimately yields superior performance and lasting durability. As a certified technician for 23 years, P&M Quality Construction stands by the Casablanca Fan product and service standards. Experienced service on all brands of fans, including: Casablanca, Hunter, Monte Carlo, Hampton Bay, Tara, Old Jacksonville, Emerson, and many others. Contact us by phone or email at patrick@pdmach.com. VERY knowledgeable, very neat and courteous. Also prepared for whatever repair our fan might need. It's so nice to find someone you can count on!